Physical Description:  p., col. ill., 30 cm. A picture book look at many of the men and women who revolutionized life for African Americans throughout history. School Library Journal - 01/01/2015 Gr 2–5—Smith tells readers in an author's note that he has "always had a love-hate relationship with Black History Month." Together with Evans, he presents 28 brief descriptions of crucial people or events in black history, ranging from 1770 to the present. Text formats include poetry, quotations, eulogies, and plays on numbers (a countdown recognizes astronauts Guion Bluford and Mae Jemison). The poetry stands out for its use of concrete form (the poem about tennis players Althea Gibson and Arthur Ashe bounces across the page) and its wordplay (singer Marian Anderson's poem incorporates one of her best-known songs). Expanding on Evans's highly textured Underground: Finding the Light to Freedom (Roaring Brook, 2011) and other works, the collage-style art matches line and color palettes to the mood of each event (for example, Martin Luther King Jr. is shown speaking against a background of outward-expanding lines of yellows and oranges). 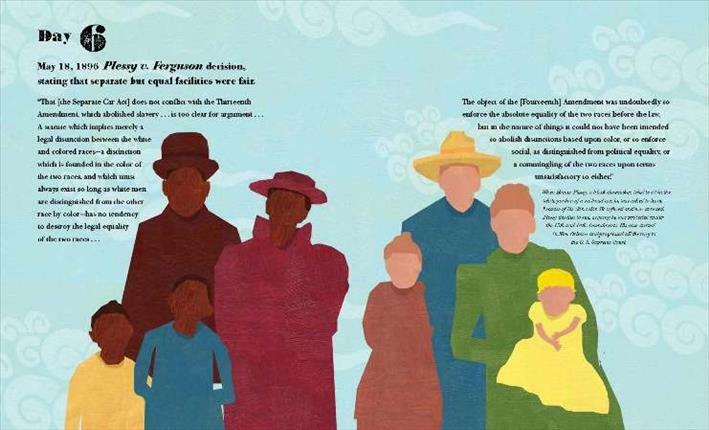 The physical book sometimes becomes part of the illustration, as when the gutter separates a black family from a white one on the pages about the separate but equal doctrine, and the boundaries between words and pictures are sometimes blurred, as when Jackie Robinson literally hits words such as inequality and prejudice out of the park. A final 29th day challenges readers to make history for themselves, and a bibliography invites further exploration. Highly recommended as a reference book, an example of poetic forms, and a work of art.—Jill Ratzan, I. L. Peretz Community Jewish School, Somerset, NJ - Copyright 2015 Publishers Weekly, Library Journal and/or School Library Journal used with permission. 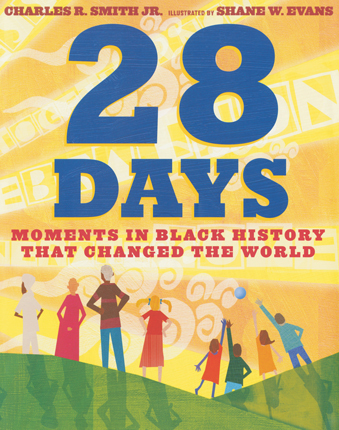 Booklist - 02/01/2015 *Starred Review* Fueled by childhood memories of hearing the same Black History Month stories about the same people and events told the same way over and over, Smith sought to convey the importance and relevance of African American contributions and milestones in a fresh, engaging manner. Using a variety of creative techniques (rhymed couplets, free verse, eulogies, primary source documents, and others), complemented by rich, vibrant illustrations, this account, with an entry for each of the 28 days in February, briefly but effectively summarizes significant events and individuals from the Revolutionary War through modern day. Day 17 presents a poem about Althea Gibson and Arthur Ashe that lobs words from line to line. Day 25 offers a countdown of 10 biographical facts about the lives of astronauts Guy Bluford and Mae Jemison. Smith’s entries are brief enough to be shared daily during a Black History Month celebration, but they’re also sufficiently compelling to read through in one sitting. Evans’ buoyant and colorful illustrations have the look of cut-paper collage, and their expressive movement and joyfulness only add to the overall feeling of celebration. The book ends with the final day’s exhortation: words of inspiration for young readers to make the most of every day. An inspiring, fresh take on a perennial topic. - Copyright 2015 Booklist.